In a large bowl, add the traditional scone mix. Cut the butter in with a pastry cutter and slowly incorporate the water until it can be formed into a rough ball. Place in the refrigerator. 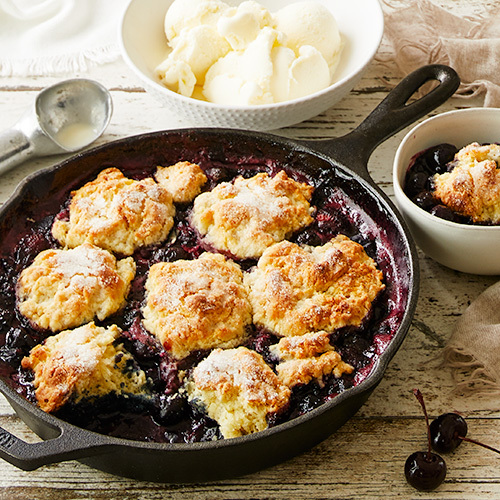 Toss the frozen berries and cherries with the flour. Add the jar of jam and mix gently until it is evenly distributed. Pour into a large cast iron pan. Heat the berry mixture over medium heat until the edges begin to bubble. At this time, drop 2 inch pieces of the scone mixture onto the top of the berries until it is covered. Gently push the scones down and then sprinkle the tops with sugar. Place the entire skillet into the oven and bake for 35-40 minutes, until the topping has browned and the berries are bubbling. Serve warm with ice cream or whipped cream.